The 40 x 53mm is a high-velocity round for automatic grenade launchers in service with the Canadian Armed Forces and its allies. The 40 × 53mm is used in automatic grenade launchers mounted on tripods, vehicles or helicopters, such as the Mk 19 grenade launcher, the Mk 47 “Striker” 40mm Grenade Machine Guns (GMGs), the Heckler & Koch GMG or the South African Vektor Y3 AGL. In these roles, the rounds are linked together with a metallic disintegrating link. The 40 x 53 mm Target Practice Marking (TPM) S422 is designed to fire out of Automatic Grenade Launchers like the Canadian Forces H&K GMG S425. Designed by Singapore Technologies (STK) the cartridge is assembled under licence by GD OTS Canada for use by the Canadian Armed Forces. Cartridge and the majority of components are manufactured and assembled in Canada to meet Canadian requirements. Upon target impact, a non-toxic orange smoke cloud marks the point of impact. The 40 x 53 mm Target Practice with Tracer Marking (TP-T M) S423 is designed to fire out of Automatic Grenade Launchers like the Canadian Forces H&K GMG S425. Designed by Singapore Technologies (STK) the cartridge is assembled under licence by GD OTS Canada for use by the Canadian Armed Forces. Cartridge and the majority of components are manufactured and assembled in Canada to meet Canadian requirements. Upon target impact, a non-toxic orange smoke cloud marks the point of impact. A minimum 5 second duration tracer is visible during the projectile trajectory. The 40 x 53 mm High Explosive Dual Purpose Self-Destruct Enhanced Blast with Insensitive Explosive (HEDP-SD EBIX) S425 grenade is designed to fire out of Automatic Grenade Launchers like the Canadian Forces H&K GMG S425. The projectile contains a shape charge capable of penetrating up to 78mm of RHA steel, surrounded by a fragmentation body which achieves a lethal blast radius of 5 meters. 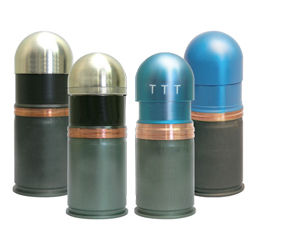 Designed by Singapore Technologies (STK) the cartridge is assembled under licence by GD OTS Canada. Cartridge and the majority of components are manufactured and assembled in Canada. The grenade’s fuze detonates upon impact or self-destructs after the spin decays under a certain value, within 10 sec of the projectile reaching its maximum range. The 40 x 53 mm Air Burst Pre-Fragmented Programmable High Explosive – Radio Frequency (PPHE-RF) C171 grenade is designed to fire out of Automatic Grenade Launchers like the Canadian Forces H&K GMG S425. Designed by NAMMO the cartridge is assembled under license by GD OTS Canada for use by the Canadian Armed Forces. At the preprogrammed, designated range, the grenade detonates and releases more than 1,400 fragments distributed to the side and to the rear. It also contains a self-destruct fuze. Shown: Canadian Armed Forces H&K GMG S425 Grenade Launcher.